I am currently making open face and hunters pocket watch glass crystals. I'm offering them at a fair price with no premium charged for rare sizes. To place an order, please call 415 255 8045 or email me. White's Crystals are worth many times their price! I commend White's Crystal service. The 15 crystals they have made for me so far which included 5 custom sizes (4 for 8-day clocks), ALL "snicked in" with out any trouble or gummy glue! The value added and quality is superb! The White's crystal alone took my fully restored Hampden 2-tone Model 1 from Excellent to EXTRA FINE Collector Grade! I have 20 more on order now. Agreed - I've only ordered from William a couple of times, but the fit and clarity were perfect. The turn-around time is very fast and the prices are impossible to beat. William can even make those thick 4mm crystals for the Silverode cases I like so much. I ordered 10 at a time last winter and was totally pleased. It is unbelievable how a new glass crystal improves the look of any watch. It suggests to the unsuspecting looker that you actually take care of your watch. I have William White's crystals on several of my watches. The quality is absolutely top notch. When you read a watch, you're looking through the crystal. Nothing improves the appearance easier than installing a new one! I have a private label pocket watch by Joseph Schuster, circa 1896, size 16s. What would you need to source a new crystal as the current one has a split in it, it is not glass. I will need to know the exact diameter required in either .01mm 0r .001" increments. Also, you can select from any available thickness: 1.2, 1.35, 1.5 & 1.75mm are available for standard 16s convex beveled crystals. The cost is $12 + $12 shipping to Australia. If you would like to send me the bezel and have me fit/install a new crystal for you, the cost is $24 + $12 ship. 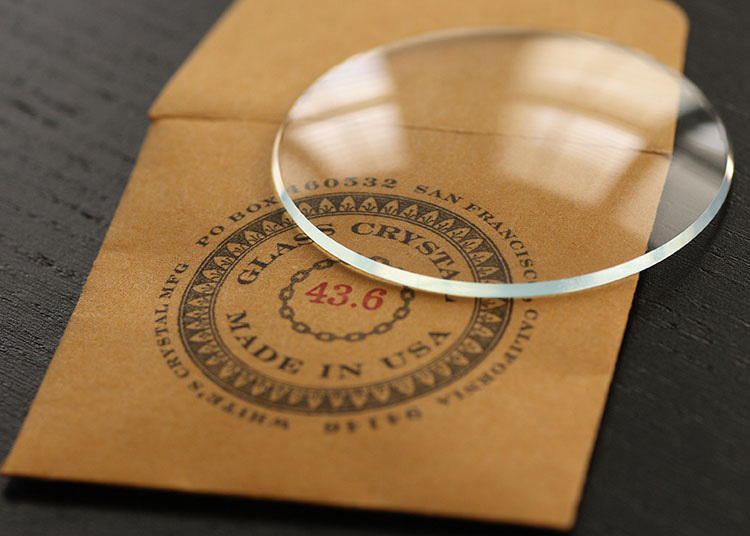 All crystals are made from the finest European optical/technical grade glass. William, sorry for the delay in replying, I have been distracted with retiring from the RAAF and moving out of Sydney to the regional town that we now live in. Could you describe where to measure the bezel to get the correct size. Also the watch currently has a thin 'plastic' lens that has cracked and fallen out. I don't mean to insinuate that this is an overly daunting process; you should be fine, but just re-measure everything to be sure. Thanks and I'll be glad to help out in any capacity.